This past Saturday (October 18), I headed to Tenaya Lake with a few friends to tackle Clouds Rest in Yosemite National Park. We arrived at the Sunrise Trailhead on the South side of Tenaya Lake at about 7:00am. Soon after we got there, a caravan of vehicles pulled up and out poured multitude young energetic souls on a mission. Many were gathered around the back of a pickup truck, unstrapping a contraption and pulling it out. The device appeared to be a cross between a sled, a wheel barrow and a wheel chair (I came to find out later it is called a Trail Rider). It soon became clear that this thing would be headed up the trail and not only that, there would be a person riding in it. Curious about what was going on, I discovered that the trip was the brain child of Nick Cunningham, the Director of Generation Fate, a non-profit organization that works with foster children. I asked Nick what inspired this event and he said "I was sitting at the top of an active volcano in Guatemala enjoying the breathtaking view of a sprawling rainforest like I had never seen before. I was in a state of awe and euphoria gazing over the beautiful landscape sure that I was the luckiest man in the world. When suddenly, and to this day I am not sure why, it dawned on me that kids who use wheelchairs could never make it to where I was sitting." He had a vision to change that and the Nobel Heights crew was born. Riding on the sled would be a special young man, Austin Taylor, a 20 year old paraplegic and "Guinea Pig". 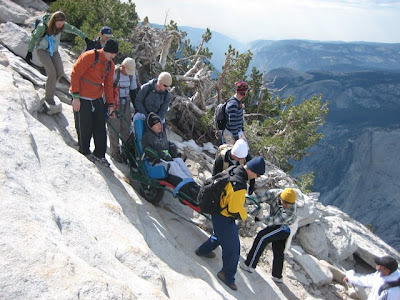 Austin was placed in the Trail Rider and supported by a team of volunteers, headed up the challenging trail to the top of Clouds Rest. My buddies and I left ahead of the group talking about Austin and how special it was to be a witness to this momentous event. 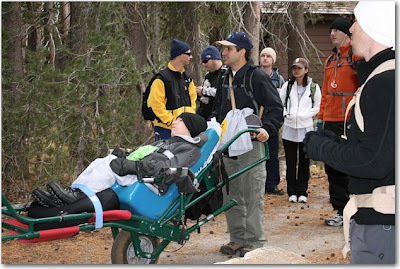 As we tackled different parts of the trail, we wondered how the heck anyone would be able to get that sled, let alone carrying someone in it, up the mountain. In a few hours, we arrived at the top of Clouds Rest. The last part of the trail is a narrow shoulder with steep drops on both sides. Surely they wouldn't make it up there. However, 20 minutes after we arrived, up came the crew. Excitement bristled among everyone at the summit. 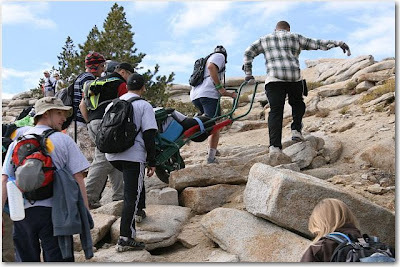 Here we were almost 10,000 ft in elevation and with us on top of the mountain was Austin, a 20-year old young man "who has used a wheelchair since birth". Being on top of Clouds Rest was an awesome experience and having the opportunity to see the heroic act of Austin and the entire Nobel Heights Crew made it that much better. I congratulate the whole team for their effort and inspiration. note: some photographs were supplied by Nick Cunnigham. Along the bay in the shadow of the Dumbarton Bridge lays a Bay Area Gem: Don Edwards National Wildlife Refuge. The territory for this park encompasses much of the wetlands of the South-East Bay, but the headquarters is in little ol' Newark. This park is teeming with birds of all sorts from waterfowl to raptors. Over 280 species can be spied at different times of the year. On a brisk Saturday morning, I packed up my new camera and headed out to play with my new zoom lens. The route I chose for this hike was a short 1.6 mile loop along the Tidelands Trail and then back through the Harrier Spur Trail. It just so happens that one of my first sites at the park was hundreds of birds gliding along the calm waters of the bay. There are trails that go out into the bay along the salt ponds, but many sections are currently under construction and closed. One of the main trails at the park is the Newark Slough, however the preferred method of travel for that route is a kayak! The Don Edwards National Wildlife Refuge is a great place for hiking and wildlife viewing. It is less crowded than its neighbor, Coyote Hills. Plus, parking is free! You can get more information on this hike at BACKPACKER Magazine.